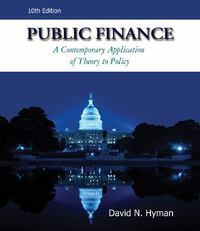 Public Finance 11 Edition Popular author and seasoned economist Dr. David Hyman delivers a solid economics-oriented approach to public finance and public policy. The 11th edition of PUBLIC FINANCE thoroughly illustrates the role government plays in the economy and explains how and why the public sector makes decisions. Packed with timely, real-world examples, PUBLIC FINANCE sparks lively discussion and debate with its coverage of such hot topics as national defense and homeland security, pollution rights, Social Security reform, federal tax reform, and the Iraq war. In addition, it includes numerous study tools and exercises to help students sharpen their economic acumen.